We've been solving pest problems for over 24 years and would love to have the opportunity to be your Bugman. Quick and professional. Good price for service. good prompt service. what else can i say. Awesome customer service when an issue arises. Steven does a great job he is very friendly. AMAZING service AND customer service!! I really like lee to do my house. But every time someone else shows up. My only complaint. Just for the fact lee knows what he did last time and if i was having any troulbe areas he could address them. Plus He's just a cool guy and he's awesome at hos job. Thank you for your review. We appreciate your feedback. I have moved your account to only have Lee service you. He will see you this Saturday. My wife and I are very very pleased with the service we are getting from custom pest control thank you so much. Barry Holcomb. Wonderful service provided and friendly staff! 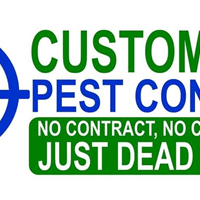 CUSTOM PEST CONTROL IS MORE THAN JUST A PEST CONTROL COMPANY. THE GUYS ARE A FAMILY AND WILL MAKE SURE THAT YOU ARE SATISFIED. ARE THEY WILL SATISFIED YOU ONE WAY ARE ANOTHER. THIS IS A GOOD COMPANY AND WILL TAKE CARE OF YOUR HOME LIKE IT IS THEIR OWN. JUSTICE ASHLEY. I WILL ALWAYS BE A CUSTOMER. I am very Pleased with the Professional people who work here. Also very detailed in the work they did. M. Loyd. You guys do a great job!!!! The technician was on time. When they are going to be late they let you know. Good work. Lee always does a great job. always on time and eager to help. We love your staff and they always do an amazing job. On time and consistent,very professional. Would definitely recommend. Courteous, on time and no more pests! Troy did my termite inspection and was very nice. Very pleased with quality of service provided. Thank you for allowing us the opportunity to service your home. very satified with service would not change really like your emploees. Very happy with their service..will continue to use these guys!..... Just dead bugs. Tony is doing a great job at our restaurant. .so are so pleased.thanks..heather. Very friendly and professional. I am very pleased with the results. Really good service with an affordable price. The gentleman who takes care of our home is kind, professional, and always has a treat for the dogs, which they appreciate! Most importantly, no pests. Great service. Would highly recommend using this company. Great, effective service. Friendly and fast. Thank you! I haven't seen any bugs since y'all have sprayed! Thank you! Custom Pest Control is prompt and thorough. Their service folks are considerate clean and responsible. I have used this company for more than ten years and am well pleased. I'm very happy with the service and looking forward to the next visit. It's working great after one time. Thank you for allowing us an opportunity to service your pest needs. There great and very affordable!!! Very happy with them!! I would recommend them!! !😊.